I don't think this is a new product by any means, but it's new to me, so I wanted to share my find with you! I found this exfoliant during a trip to Whole Foods. Strange, but true! I ran over for a few groceries without Audrey one night, and I had some fun perusing the beauty product aisle. I wasn't looking for an exfoliant in particular, but this one caught my eye. It contains activated charcoal to extract impurities, volcanic ash to dislodge pollutants, and acai and goji berry to detoxify and recharge cells. Reading that alone had me sold. It just sounded pretty awesome, and so much more than just an exfoliant. I've been using it once a day for over a month now, and I can say that I highly recommend it! It's probably the most gentle, yet effective exfoliant I've used. It doesn't leave my skin red, irritated or overly dry. After just the first use, I noticed my skin was immediately softer and smoother, and it has only gotten better over time. 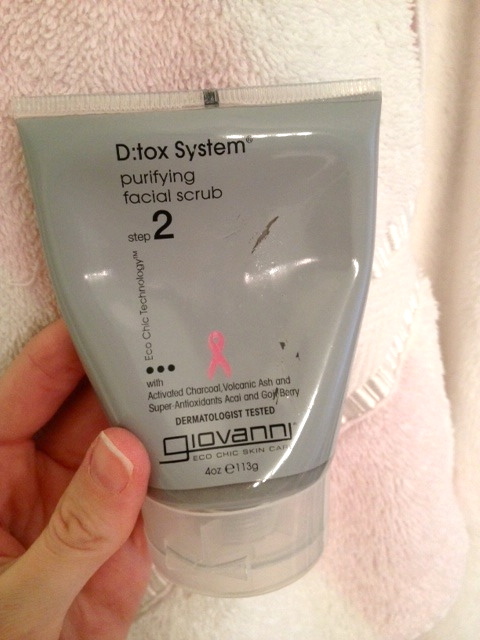 This exfoliant is actually step 2 of a 3 part system from Giovanni, and based on how much I love this scrub, I'd be very interested to try the whole system. Another great thing about this product and all products in the Dtox System), is that 5% of all sales are donated to the National Breast Cancer Foundation. This scrub is definitely a new staple in my beauty routine! If you're looking for an exfoliating scrub, I really think you'll like this one! It retails for $9.95 and you can purchase it here. I think I'm going to have to try this product! Sounds great. I am going to have to try this too! Thanks for sharing! Thanks girls! I think you'll really like it! JCrew & NY&Co nursing-friendly finds! Cute find-Ann Taylor Loft shorts! Small Wall review and giveaway!